Main Point: I have the POWER to love! The U.S.S. Starburst continued it’s adventure to guide the ship back to Earth when an alarm sounded indicating the ship was losing power! See if Sam E. Sprocket learned who the real source of our power is and collected enough fuel stars to continue the journey home. 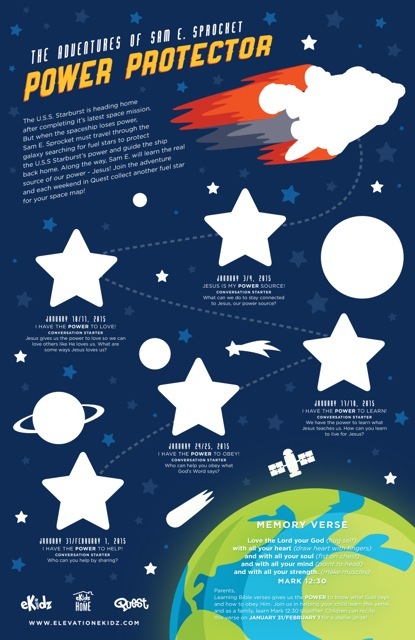 Your child can follow Sam E. Sprocket and his space adventure with their own space map! Each weekend children can collect another fuel star for their space map as we help Sam E. journey back to Earth. This weekend children collected their second fuel star – the red fuel star – while learning I have the POWER to love! Miss the first or second adventures with Sam E. Sprocket? 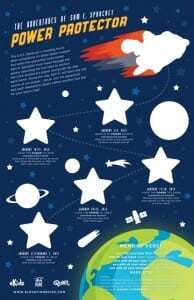 Print the green fuel star (January 3/4) or the red fuel star (January 11/12) and help your child glue it to their space map! Learning Bible verses gives us the POWER to know what God says and how to obey Him. Join us and learn this Mark 12:30 together as a family! Children can recite this verse on JANUARY 31/FEBRUARY 1 for a stellar prize!